Don’t know what to do with that aging kimchi in your fridge? Here is one of many traditional Korean dishes that use old kimchi. 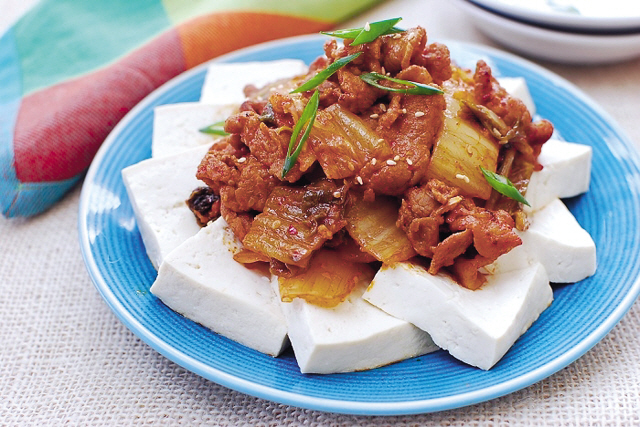 Spicy kimchi is stir-fried with pork (you can omit the pork to make it a meatless dish) and served with sliced tofu that has been either boiled or pan-fried. Kimchi and pork are a classic combination in Korean cooking. The taste is intoxicating, with the pungency of kimchi and the rich flavor of fatty pork. The crunchy texture of the kimchi and the meatiness of the pork complement the naturally soft tofu. This dish can be a side dish or a main dish served with a bowl of rice. It’s also a popular drinking snack or appetizer. Cut the kimchi and pork into bite sizes. Thinly slice the onion and scallions. In a large bowl, combine kimchi, pork, onion, scallions and the remaining ingredients and mix well. Let it stand for 15 minutes. In a medium-sized pot, bring about 4 cups of water to a boil. Reduce the heat to medium high and add the tofu. Boil for 5 minutes. Carefully transfer the tofu to a colander to drain. Cut the tofu into two blocks. Cut each block into about 1/2-inch-thick slices. Heat a large pan over medium-high heat, and add the kimchi and pork mix. Stir-fry until the kimchi becomes soft, the pork is cooked through, and most of the liquid generated during the cooking process has evaporated (about 5-6 minutes). Arrange the tofu slices nicely on a plate leaving an open space in the center. Place the stir-fried kimchi and pork in the middle and serve.